A Jack-sized hello and THANK YOU for visiting my website! We’re glad you stopped by. Please stay a while and check out the boys and girls, and if you have any questions or would like information on Mastiffs, please don’t hesitate to contact me. I am more than happy to talk dogs and Mastiffs! 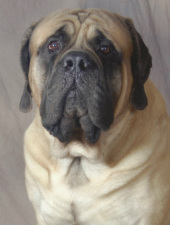 My name is Lisa Eddy and I have been involved in Mastiffs since 1996. My goals are to raise and show healthy and happy Mastiffs and to provide assistance and support to people who have a Mastiff or are considering adding one to their family. I believe that breed type, overall health, soundness and good temperament are ALL important attributes and I strive to obtain these characteristics in my own dogs. If you are interested in a puppy or owning a mastiff, please visit here.